Fox Searchlight is bringing the late rap icon, the Notorious B.I.G., to the big screen! Biggie rocked Kani gear and put him in his lyrics, so it only made sense for Biggie to wear some Kani clothing in the movie! Mr. Kani happened to be in New York while they were filming so he stopped by to check it out. On the set Karl hung out with Biggie's mother, Voletta Wallace, who's efforts made the film possible. 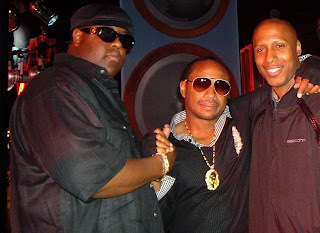 Jamal Woolard, a Brooklyn-based rapper, will play Biggie (seen with Karl Kani below).